Peel some English cucumber and cut into thick chunks. Cube some watermelon about the same size, and remove the seeds. Place these in a bowl. In a small prep bowl, whisk together 15ml (1T) olive oil and 30ml (2T) cider vinegar. Drizzle this over and give it a toss. Grind on a few good grinds of pepper. Then julienne some basil leaves and sprinkle over the top. We’re lucky enough to have lots of fresh basil growing on the urban farm, but it’s plentiful in stores right now, or in farmer’s markets. Put the whole thing in the fridge until it’s well-chilled. It’s a sure-fire solution to cool you off on a sultry summer day. No time for food styling, it’s coleslaw time! This is an ultimate summer dish because it’s cool, crunchy, and fast to make on a hot day. Given that we’ve been having record high temperatures for weeks on end, that’s vital! 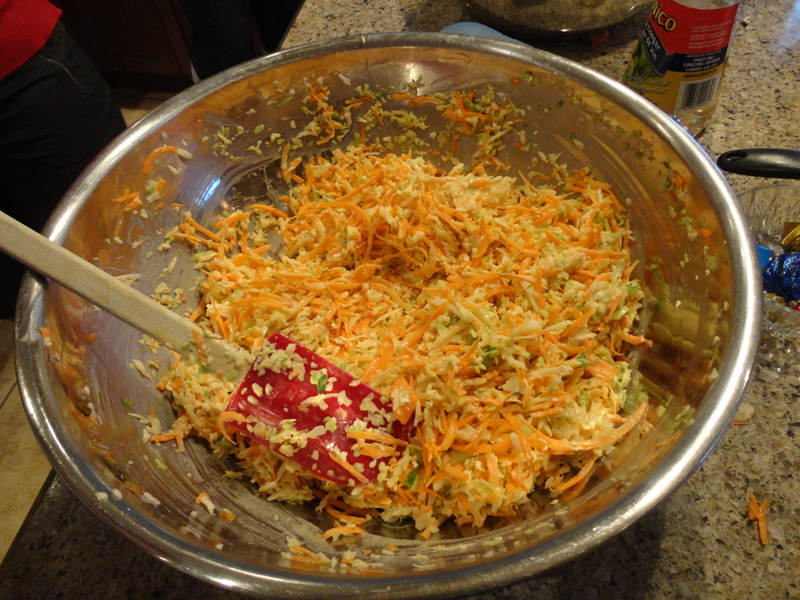 Moreover, the great thing about coleslaw is that it only takes a few ingredients, usually easily available. In our case we went to Kelly’s Fruit Market and Plank Road Market for a cabbage and some carrots. We could have hand-grated, but in this case we used a food processor to shred them together. Then we mixed in a generous dollop of mayonnaise. (Disclaimer alert: the mayo wasn’t walkable, exactly. We walked to a store in France and we walked it home in our suitcase. It’s from Maille, the famous mustard people. And it’s full of egg-y goodness, just like mayonnaise you’d make yourself, if you had time. We also gave a good splash of white wine vinegar, and a liberal shake (probably a teaspoon, for a bowl this size) of celery seed. That’s it. Stir it all together, let it stand for a few minutes in the fridge (or longer if you’d like) for the flavours to develop. We served it with the amazing halibut in yesterday’s blog, and it was a big hit. So the other day we were at Belanger Brothers in the farmer’s market (see our blogroll!) and we picked up this awesome rack of lamb. 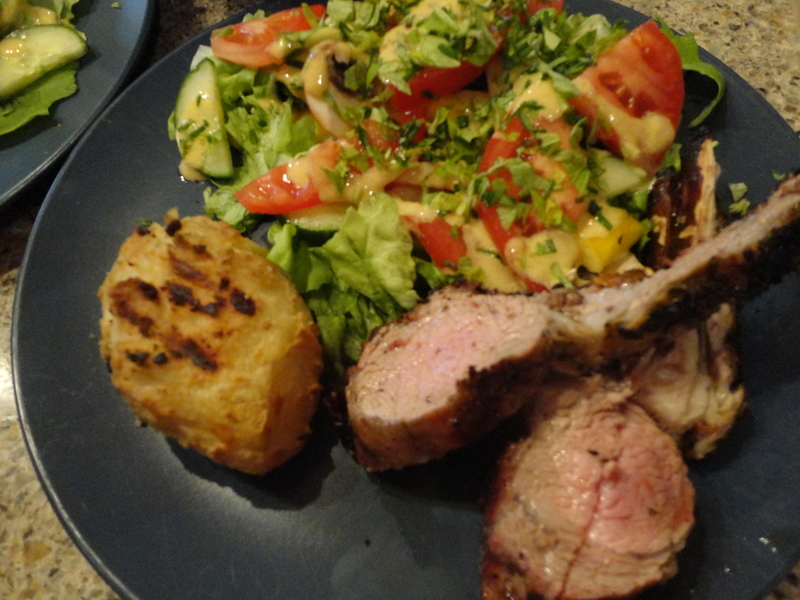 One delicious thing to do with lamb is to make a mustard coating – some olive oil, Dijon mustard, and chopped herbs. In our case we used rosemary and Greek oregano from the garden. Then we thought, why not make a mustard theme. So we proceeded to modify a recipe from Rob and Gwen in Bicester. They make an awesom mustard roast potato. 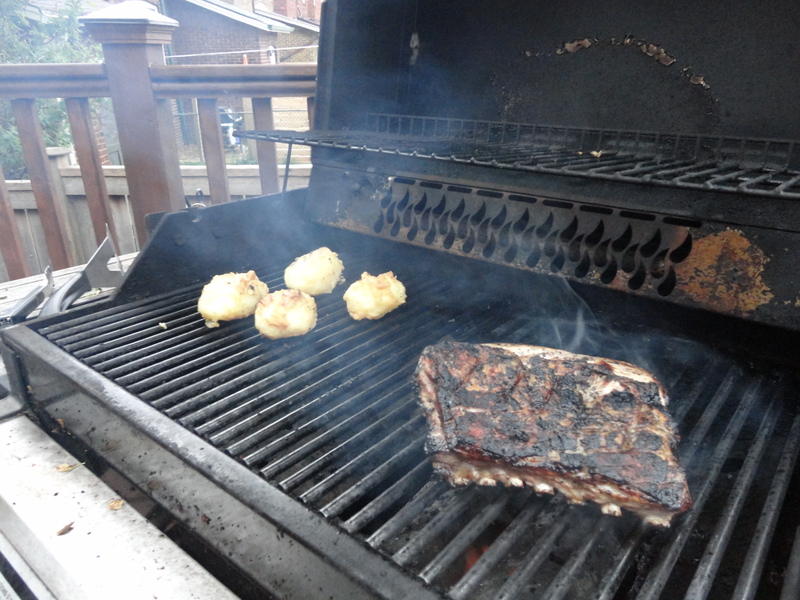 To adapt for the grill, we parboiled some peeled Yukon Gold potatoes. We tossed the hot potatoes with a couple of tablespoons of olive oil, a splash of white wine vinegar, and a tablespoon of dry mustard. Then we put them on the grill to finish with the lamb. Each dish had a little mustard, but none of the mustards tasted the same. On some, it was the feature. Others, it was the under-note. In every one of them, it was delicious! 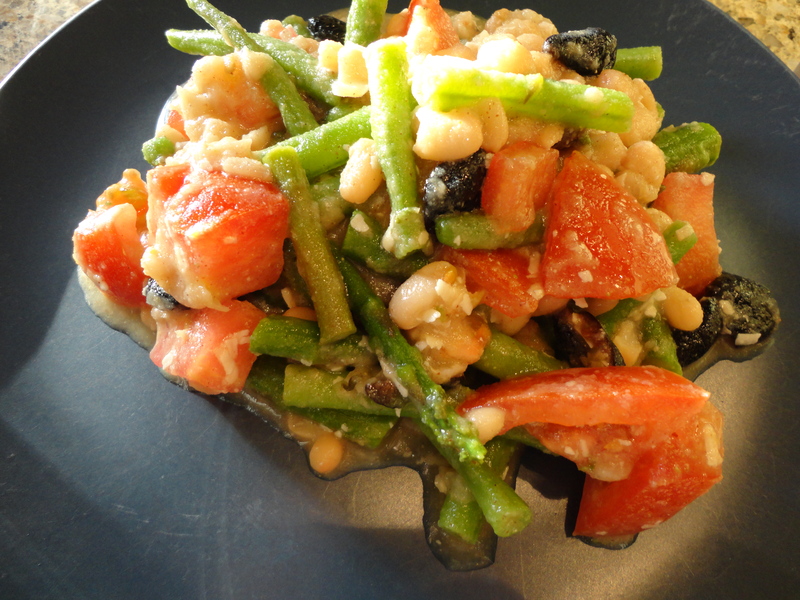 Lastly, we made our usual salad dressing like the one we used in the Salad Huroncoise…also featuring delicious Dijon. Here’s what the finished plate looked like. Now I’m going to head inside and beat the mosquitoes! As farmer’s market begins and more seasonal products are available, the menu plan needs to be flexible. What looked good today? What was a great deal? What was fresh? This week we had some chicken thighs in the freezer. But asparagus is really the star, and it’s everywhere. So we made our usual chicken marinade of olive oil, lemon, pepper and garlic, and let the thighs rest a bit. We put similar flavours on the asparagus. 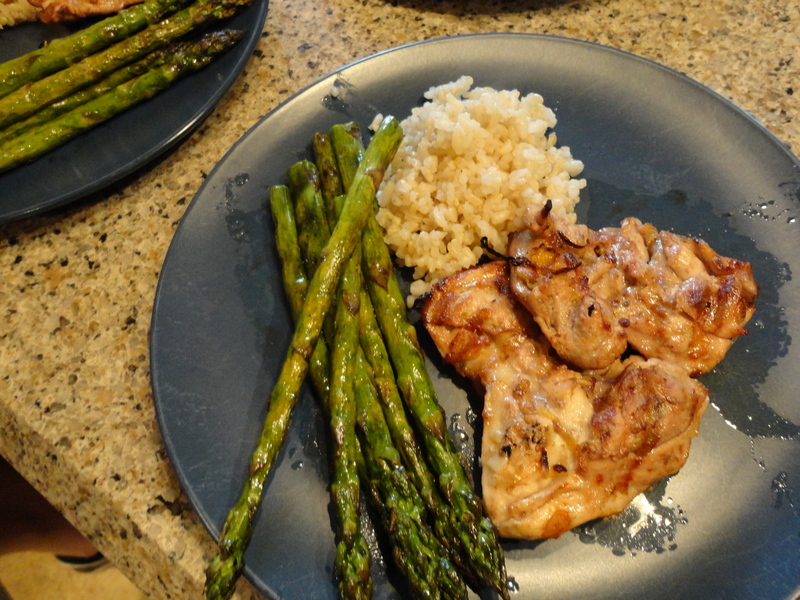 Everything went on the grill, and the meal was rounded out with some delicious short grain brown rice from Better Bulk, which had been pre-cooked and frozen. A quick heating in the microwave (or steaming on the stovetop) and we were ready to eat. Relaxing and easy, without over-heating the house as the spring temperatures ramp up for summer.